What is the purpose of the requirements for bicycles? This regulation increases the safety of bicycles by establishing, among other things, requirements for assembly, braking, protrusions, structural integrity and reflectors. Bicycles that fail any of the requirements are banned under the Federal Hazardous Substances Act. Where can I find the requirements for bicycles? The requirements are in the Code of Federal Regulations (CFR) in Title 16, Part 1512. A bicycle is defined in §1512.2 as either (1) a two-wheeled vehicle having a rear drive wheel solely human-powered; or (2) a two- or three-wheeled vehicle with fully operable pedals and an electric motor of less than 750 watts (1 h.p. ), whose maximum speed on a paved level surface, when powered solely by such a motor while ridden by an operator who weighs 170 pounds, is less than 20 mph. The bicycle requirements cover two different types of bicycles. Those with a seat that is more than 25 inches above the ground when the seat is adjusted to its highest position must meet all of the requirements. Sidewalk bicycles – those with a seat height of 25 inches or less – are exempt from some of the requirements or have other alternative requirements. These exemptions and alternatives are marked in bold type in this summary. Please consult §1512.2 of the requirements for more information on how to measure seat height. Are any bicycles exempt from the requirements? Yes. Track bicycles designed and intended for use in competition that have tubular tires, a single crank–towheel ratio, and no freewheeling feature are exempt. So are one-of-a-kind bicycles made to the order of an individual without assembling stock or production parts. How are bicycles tested in general? Assembled bicycles must meet the requirements of the regulation in the condition in which they are offered for sale. Unassembled or partially assembled bicycles must meet the requirements after assembly according to the manufacturer’s instructions. Are there any general requirements that bicycles must meet? (1) Adults of normal intelligence and ability must be able to assemble a bicycle that requires assembly. (2) A bicycle may not have unfinished sheared metal edges or other sharp parts that may cut a rider’s hands or legs. Sheared metal edges must be rolled or finished to remove burrs or feathering. (3) When the bicycle is tested for braking (§1512.18(d) and/or (e)) or road performance (§1512.18(p) or (q)), neither the frame, nor any steering part, wheel, pedal, crank, or braking system part may show a visible break. (4) Screws, bolts, and nuts used to fasten parts may not loosen, break, or fail during testing. (5) Control cables must be routed so that they do not fray from contact with fixed parts of a bicycle or with the ends of the cable sheaths. The ends of control cables must be capped or treated so that they do not unravel. (6) A bicycle may not have any protrusions within the shaded area of Diagram 1. However, control cables up to ¼ inch thick and cable clamps made of material not thicker than 3/16 inch may be attached to the top tube. What are the requirements for brakes? Bicycles must have front and rear brakes, or rear brakes only. Sidewalk bikes may not have hand brakes only. Sidewalk bikes with a seat height of 22 inches or more when adjusted in the lowest position must have a foot brake. A sidewalk bike with a seat height of less than 22inches need not have any brake as long as it does not have a freewheeling feature, has a permanent label saying “No brakes”, and has the same statement on its advertising and shipping cartons. Please refer to §§ 1512.5(e) and 1512.18(f) of the regulation for more detail on sidewalk bicycle brake performance and labeling. (a) When tested, hand brakes may not break, fail, or have clamps that move or parts that go out of alignment. To test the brakes, push the hand lever all the way down to the handlebar or with a force of 100 pounds (lbf) and then load test the bicycle, or rock it back and forth with a 150-pound weight on the seat. §1512.18(d)(2) contains the procedures for loading and rocking testing. (b) Hand levers have to be on the handlebars and readily usable. The distance between middle of a hand lever and the handlebar may be no wider than 3 ½ inches (3 inches for levers on sidewalk bicycles). Unless a customer specifies otherwise, the hand lever that operates the rear brake must be on the right handlebar. The lever that operates the front brake must be on the left handlebar. A lever that operates both brakes may be on either handlebar. Please note that, if a bicycle has hand lever extensions, all tests are conducted with the extensions in place. (c) A bicycle that only has hand brakes must stop within 15 feet when tested with a 150-pound rider riding at 15 miles per hour. See §1512.18(d) for more detail on this test. (d) When the hand lever is pushed down with 10 pounds or less applied 1 inch from the end of the lever, the brake pads must contact the braking surface on the wheel. Caliper brake pads must be replaceable and adjustable. Pads must stay in their holders without movement when a 150-pound rider rocks the bicycle forward and backward. See §1512.18(d)(2) for this test. (e) Brake assemblies must be securely fastened to the bicycle frame with locking devices such as lock washers or locknuts, and must not loosen during the rocking test, §1512.18(d)(2). Brake pad holders must be securely attached to the caliper assemblies. (2) Foot brakes: (a) Foot brakes must operate independently of any drive-gear positions or adjustments. Foot brakes must have a braking force of at least 40 lbf when 70 pounds of force is applied to the pedal. See§1512.18(e)(2) for the test procedure. (b) Bicycles with foot brakes must stop within 15 feet when tested with a rider of at least 150 pounds at a speed of 10-mph. See §1512.5(c). A bicycle operated in its highest gear ratio at 60 pedal crank revolutions per minute that reaches a speed of more than 15 mph must stop in 15 feet when tested at a speed of 15 mph if it has a foot brake only. See §1512.18(e)(3) for the stopping test procedure. (c) A foot brake must operate by applying force in the direction opposite to the force that drives the bicycle forward, unless the brakes are separate from the pedals and apply the braking force in the same direction as the drive force. (d) When you hold a torque of 10 ft-lb at each point on the crank at which a rider can apply the brakes, that point cannot be more than 60 degrees away from the point on the crank at which the rider can start to pedal forward. (e) See §1512.18(e)(2) and (f) for tests for foot brakes on sidewalk bicycles. What are the requirements for steering systems? 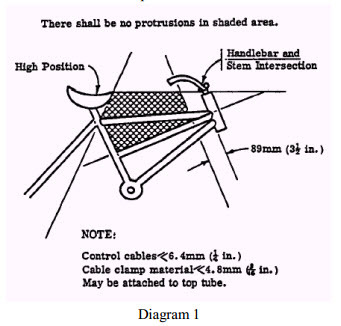 (1) The handlebar stem must withstand a force of 450 lbf (225 lbf for sidewalk bicycles) in a forward direction 45 degrees from the stem centerline when tested according to §1512.18(g). The handlebar stem must have a permanent mark or circle showing the minimum depth that the stem must be inserted into the bicycle fork. That mark must be located a distance of at least 2 ½ times the diameter of the stem from the bottom of the stem, and must not affect the strength or integrity of the stem. (2) Handlebars should be symmetrical on either side of the stem. The handlebar ends should be no more than 16 inches above the seat when the seat is in its lowest position and the handlebars are in their highest position. (3) The ends of the handlebars must be capped or covered. Grips, plugs, and other devices mounted on the ends must not come off when a force of 15 lbf is applied. See §1512.18(c) for this test. (4) When the handlebar/stem assembly is twisted with a torque of 35 ft-lb (15 ft-lb for sidewalk bicycles), it must not move or show any signs of damage. When the handlebars are twisted with the stem being held firmly, the handlebars must support a force of 100 lbf or absorb no less than 200 inch pounds of energy while bending no more than 3 inches. During this test, the handlebars must be tight enough so that they do not turn in the handlebar clamp. After the test, they cannot show any visible sign of breaking. See §1512.18(h) for these tests. What requirements must pedals meet? (1) Pedals must have treads on both sides. However, pedals that have a definite side for the rider to use only have to have a tread on that side. Pedals intended to be used only with toe clips do not have to have treads as long as the toe clips are firmly attached to the pedals. However, if the clips are optional, the pedal must have treads. (2) Bicycle pedals must have reflectors. See §1512.16(e) for this requirement. Sidewalk bicycle pedals do not have to have reflectors. What are the requirements for chains and chain guards? (1) A chain must operate over the sprocket without binding or catching, and must have a tensile strength of 1800 lbf (1400 lbf for sidewalk bicycles). (2) Bicycles with a single front and a single rear sprocket must have a chain guard over the top of the chain and least 90% of the part of the front sprocket that the chain contacts. It must also extend back to within at least 3.2 inches of the center of the bicycle’s rear axle. The top of the guard from the front sprocket back to the rear wheel rim must be at least twice as wide as the chain. Past that point, the top of the guard may taper down until it is ½ inch of the chain width. The guard must prevent a 3 inch long, ⅜ inch diameter rod from catching between the upper junction of the sprocket and the chain when a tester tries to insert the rod at any direction up to a 45 degree angle from the side of the bicycle that the chain is on. (3) Derailleurs must be guarded to prevent the chain from interfering with or stopping the wheel through improper adjustment or damage. Are there requirements for tires? Yes. The manufacturer’s recommended inflation pressure must be molded onto the sidewalls of inflatable tires in letters at least ⅛ inch high. The tire must stay on the rim when it is inflated to 110% of the recommended pressure, even when it is tested under a side load of 450 lbf. See §1512.18(j) for this test. Tires that do not inflate, tubular sew-up tires, and molded wired-on tires do not have to meet any of these requirements. What requirements are there for wheels? A wheel must have all of its spokes and be at least 1/16 inch away from each side of the fork and from any other part of the frame as the wheel turns. When the wheel is tested with a side load of 450 lbf, the tire and spokes must stay on the rim. See §1512.18(j) for this test. Sidewalk bikes do not have to meet the side load requirements. What requirements must wheel hubs meet? (1) Each wheel must have a positive locking device that fastens it to the frame. Use the manufacturer’s recommended torque to tighten threaded locking devices. The locking devices on front wheels (except for quick-release devices) must not loosen or come off when a tester tries to take them off using a torque of 12.5 ft-lb applied in the direction of removal. Once fastened to the frame, the axle of the rear wheel must not move when it receives a force of 400 lbf for 30 seconds applied in the direction that removes the wheel. (2) Quick-release devices with a lever must be adjustable to allow the lever to be set for tightness. Riders must be able to clearly see the levers and determine whether the levers are locked or unlocked. When it is locked, the clamping action of the quick release device must bite into the metal of frame or fork. hub in the same direction as the slots in the fork. See §1512.18(j)(3) for this test. Are there strength requirements for the fork and frame? Yes. Clamp the front fork in the test fixture so it does not move and apply force until the fork bends 2 ½ inches. The fork shall have no evidence of fracture. The deflection at a force of 350-in-lbs shall be no greater than 2½ inches. Also, when the fork is mounted on the bicycle frame, the fork and frame assembly must withstand a steady force of 200 lbf or an impact force of 350 in-lbs, whichever is more severe, without breaking, or bending in a manner that would significantly limit the steering angle over which the front wheel can turn. Please see§1512.18(k)(1) and (2) for the tests for forks and fork/frame assemblies respectively. These requirements do not apply to sidewalk bicycles. What are the requirements for seats? (1) The seat post must have a permanent mark or circle showing the minimum depth that the post must be inserted into the bicycle frame. That mark must be located a distance of at least two times the diameter of the seat post from the bottom of the post, and must not affect the strength of the post. (2) No part of the seat, seat supports, or accessories attached to the seat may be more than 5 inches above the surface of the seat. (3) The clamps used to adjust the seat must be able to fasten the seat to the seat post in any position to which the seat can be adjusted and prevent the seat from moving during normal use. Following testing (§1512.18(p) or (q)), neither the seat nor seat post may move when subjected to a downward force of 150 lbf (75 lbf for sidewalk bicycles) or a horizontal force of 50 lbf (25 lbf for sidewalk bicycles). See §1512.18(l) for these tests. Are there requirements for reflectors? Yes. To make sure that motorists can see bicycle riders at night, bicycles (other than sidewalk bicycles) must have a combination of reflectors. Because of the complexity of these requirements, we have not attempted to include all of the tests and detail in this summary. You should carefully read the provisions of §1512.16 for more specific information. Generally, bicycles must have a colorless front reflector, recessed colorless or amber reflectors on the back and front sides of the pedals, and a red reflector on the rear. They must also have a reflector mounted on the spokes of each wheel, or reflective front and rear wheel rims or tire sidewalls. See §1512.18(n) for tests that measure the reflectance value of reflectors. 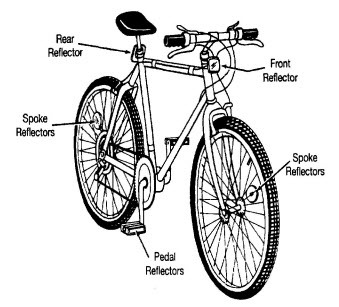 The front and rear reflectors must be mounted so that they do not hit the ground when the bicycle falls over. The requirements of the regulation also include specific angles for mounting the reflectors. See §1512.18(m) for tests that apply to front and rear reflectors. The side reflector on a front wheel must be colorless or amber, and the rear wheel side reflector must be colorless or red. Reflective material on the sidewall or rim of a tire must go around the entire circumference, must not peel, scrape, or rub off, and must meet certain reflectance tests. See §1512.18(o) for these reflectance tests and§1512.18(r) for the abrasion test for reflective rims. What other requirements must bicycles meet? (1) A rider weighing at least 150 pounds must ride a bicycle at least 4 miles with the tires inflated to maximum recommended pressure. The rider must travel five times at a speed of at least 15 miles per hour over a 100 foot cleated course. See §1512.18(p) for this test. During these tests, the bicycle must handle, turn and steer in a stable manner without difficulty, the frame and fork, brakes, and tires must not fail, and the seat, handlebars, controls, and reflectors must not become loose or misaligned. These requirements do not apply to sidewalk bicycles. (2) A sidewalk bicycle loaded with a weight of 30 lb. on the seat and 10 lb. on each handlebar grip must be dropped (while maintaining an upright position) one foot onto a paved surface three times in the upright position. Without the weights, the bicycle must be dropped three times on each side in any other orientation. During these tests, the wheels, frame, seat, handlebars, and fork must not break. See §1512.18(q) for this test. (3) A bicycle must be able to tilt 25 degrees to either side with the pedals in their lowest position without the pedal or any other part of the bicycle (other than tires) hitting the ground. (4) Bicycles without toe clips must have pedals that are at least 3 ½ inches from the front tire or fender when the front tire is turned in any direction. See figure 6 of §1512 for more detail about this requirement. What requirements are there for instructions and labeling for bicycles? (1) Every bicycle must have an instruction manual attached to its frame or included in the bicycle packaging. The manual must include operation and safety instructions, assembly instructions for complete and proper assembly, and maintenance instructions. See §1512.19 for more detail. (2) If a bicycle is sold less than fully assembled or adjusted, any advertising material and the outside of the shipping carton must include a list of tools necessary to assemble and adjust the bicycle and a drawing showing the minimum length of the leg of a rider for whom the bicycle is appropriate. That length must allow at least one inch between the top tube and the crotch of the rider when the rider’s feet are on the ground. (3) Every bicycle must have a permanent marking or label that shows the name of the manufacturer or private labeler and that the manufacturer or private labeler can use to identify the month and year the bicycle was manufactured. If the bicycle is privately labeled, the label must have information that the private labeler can use to identify the manufacturer of the bicycle. This communication has been prepared for general informational purposes only. This summary documentdoes not, and is not intended to, constitute legal advice nor does it replace or supersede a manufacturer’s obligations to comply with all applicable laws, regulations, standards, or bans enforced by CPSC. This communication has not been reviewed or approved by the Commission, and does not necessarily represent their views. Any views expressed in this communication may be changed or superseded by the Commission.